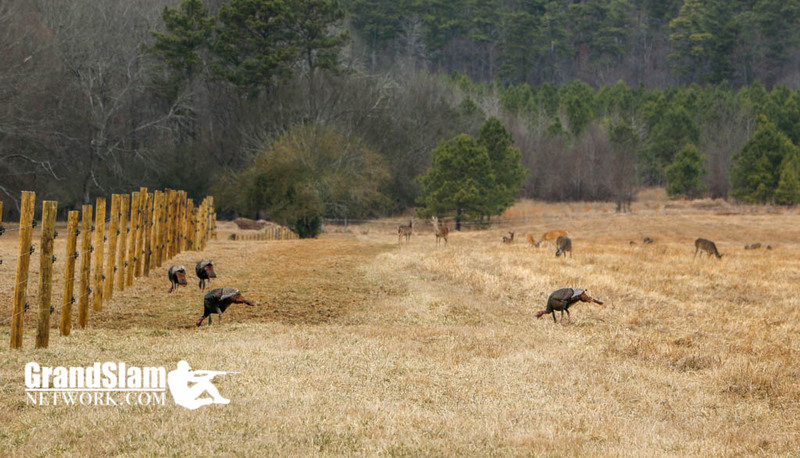 Often times we have articles and other works submitted by our members here on the Turkey Hunting Forum. 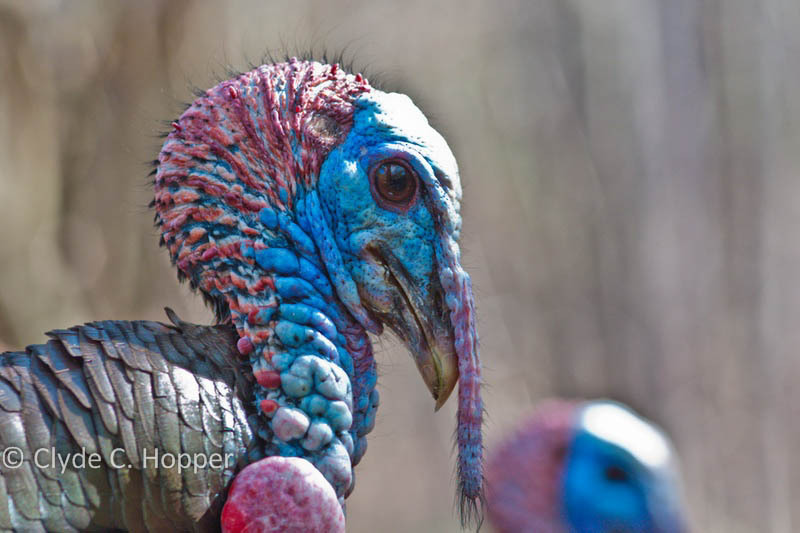 Gary Meinke, a GSN member submitted this Dead Turkey Observation and Examination quiz, which contains a great deal of interesting information that might just stump even the most seasoned turkey hunters among us! The roost was in an old river channel and we found the slight drop in elevation protected us from the wind. In the blind it was really quite pleasant as we watched big flakes of snow float softly to the ground. We called periodically, and a little before sunset I looked out my side of the blind. Just 25 feet away there was some movement at the top of some weeds that I couldn’t figure out. Finally I realized I was looking at the head and neck of a hen turkey. I didn’t recognize what I saw at first, because she was covered with a half inch of snow from the base of her neck to her tail. Her body just blended in with the white background. The hen fed around the blind for a while and eventually shook off all the snow that had accumulated on her. Les commented how cold, wet, and miserable she looked. The hen soon moved off and flew up to roost about 70 yards away. We managed to slip out of the area without flushing her. Les and I never saw or heard a gobbler that evening, but I will never forget that hunt. 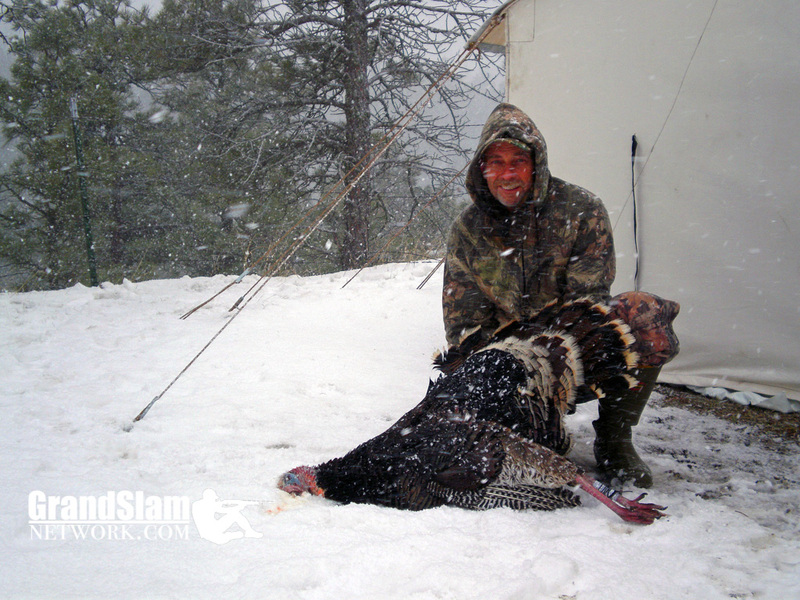 Hunting turkeys in the snow can produce some special memories. 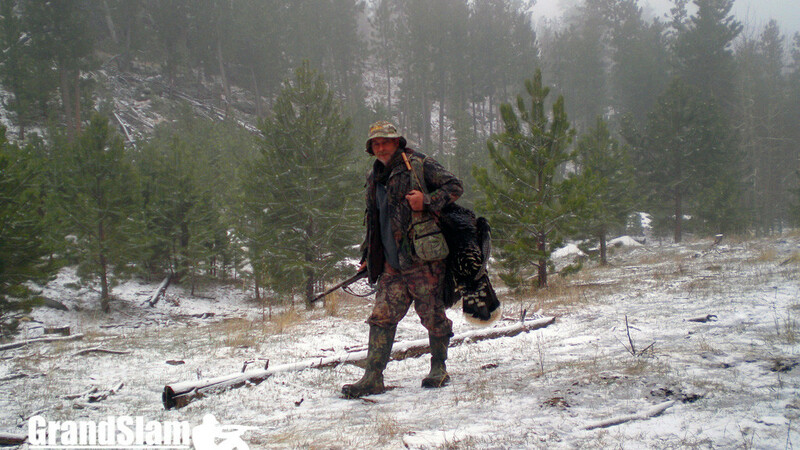 I do most of my turkey hunting out west and spring snowstorms are not uncommon during the turkey season. I have experienced spring snows as late as the third week in May. Our spring snows usually come with a good dose of wind, and many fall into the blizzard category. It seems I hunt turkeys in the snow at least once every other spring, and two or three times in some of the more volatile springs. I have put together some observations on how a spring snow affects turkeys and hunting them. However, my experience with hunting turkeys in snow is limited to the Rio Grande and Merriam’s turkey. I have yet to hunt Easterns in the snow. If you are hunting out west for a Rio or Merriam’s and find yourself hunting in snow, then perhaps you may find some of the following information useful. Both Rios and Merriam’s tend to gather in pretty large flocks in the winter. In cold late springs these flocks don’t break up until just before the spring hunting season opens. An early spring snowstorm can delay flock break up. Once breakup occurs, a snowstorm may cause the birds to regroup into flocks of 10-25 birds. For Rios this means the flocks may be fewer and farther in between, but more birds in each flock. In the case of Merriam’s in the mountains, the birds may migrate vertically downhill in a spring snow after flocking back together. If you are hunting public lands, which are usually at higher elevations, the birds may just move to lower elevations which are usually private lands. Since these spring snows are not uncommon, some turkeys do take them in stride and stay up high. When hunting higher elevation public lands during a storm, I have managed to find a few birds still weathering the storm. Turkeys may just choose to hole up in sheltered areas during the intense part of a storm. The birds are out there 24/7 and will have to feed and move about sooner or later. When a storm finally does break the toms are pretty anxious to get back to the task of breeding. If the snow quits and the wind dies down some gobblers may start sounding off even in the middle of the day. And if the temps are rising with some snow melting, things will be getting back to normal relatively quickly. However, if the snow is very deep (close to a foot or more) it may take several days for the turkeys to resume their normal routine. Prolonged cold and several storms during the spring may delay nesting in hens for a week or more. This could affect how the breeding flock structure progresses later in the season. The hens may not be leaving the gobblers as readily to lay their eggs. There are really not many advantages of hunting in snow. The competition of other hunters certainly is reduced. 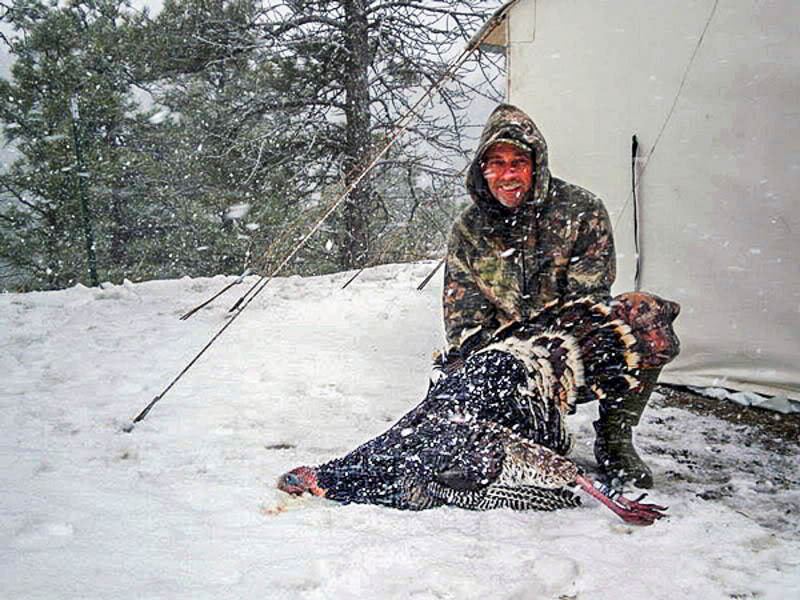 About the only other hunters out there are ones that pre-planned a hunt for that particular time and ended up hunting in the snow by chance, or the few turkey hunting nuts, like me, that think its fun to chase gobblers in the snow. Local hunters normally just wait for the weather to improve. Here Tracks will certainly be more easily revealed wherever turkeys roam. In snow it is easy to tell fresh tracks from those even a few hours old. You may be able to track a flock and anticipate the direction they are going and have an opportunity to head them off. 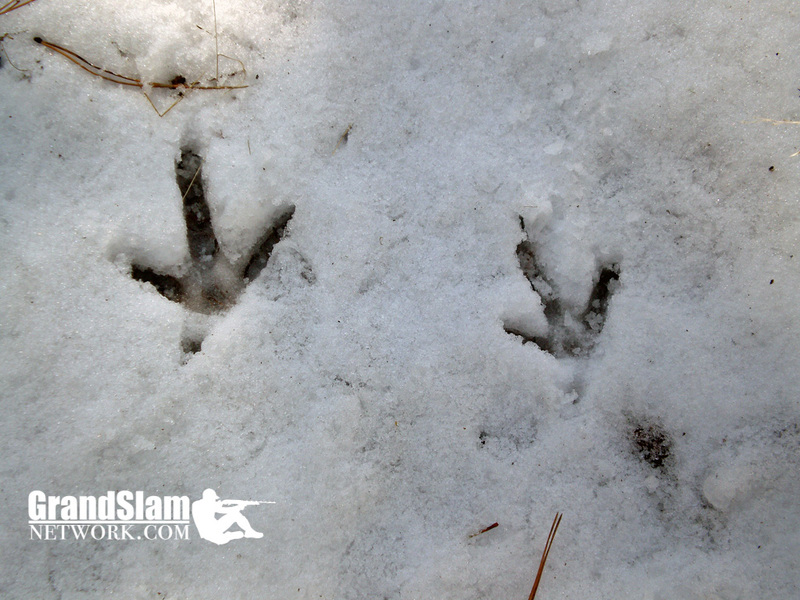 Tracks that end suddenly or start from nowhere indicate the location where turkeys have flown up or down from a tree. Find this subtle clue and you have probably just found a roost site. Turkeys are much easier to see in the snow. Out west where the country is open, it is very likely that you could spot a flock from a good distance just by doing some glassing with binoculars. Spotting turkeys is also simpler because the size of the area to search may be reduced if some portions of it are clear of snow. Wind can blow areas clear or the sun will melt the south facing slopes sooner, so check those spots first. Even though turkeys could easily scratch through shallow snow, they seem to prefer clear ground or where the snow is almost gone. The biggest disadvantage of a spring snowstorm may be the inability to get to the hunting area. Backcountry roads can be difficult to navigate at best. Many are just not plowed. Even when the storm is over and the snow is melting the roads can be very slippery. However if you happen to be camping in your hunting area when the storm hits, those same difficult roads could keep others from getting in, this turns a disadvantage into an advantage. Just make sure you are always prepared for the unexpected and have plenty of food, water and warmth. Crunchy snow can be another major problem. Spring snows are almost always a wet snow. The daytime temperature may be close to, or above the freezing mark, but nighttime temps usually go below freezing. This means that slushy wet snow becomes hard and results in a very noisy, crunchy snow by morning. Consequently, it can be extremely difficult if not impossible to move in on a roosted gobbler. Not only can turkeys hear you moving from a great distance, they can see shadows against the snow in very low light. You lose the cover of darkness. Although, you can see turkeys better in the snow, they can also see you better. For a turkey, their eyes are its greatest asset. It is especially challenging for a hunter to try to remain hidden on a carpet of white. A white sheet over your legs and partially up your waist can help you blend in while sitting up against a dark tree. The sheet can easily be carried in the back pouch of a turkey vest when moving. As I mentioned previously, turkeys may flock up a bit and that means more areas without turkeys. This can mean a lot of leg work before you make any contact with birds. For Merriam’s this is especially the case because their density is less concentrated. The inclement weather may also tone down the frequency of gobbling. The cold and wet can make for some uncomfortable hunting. Waterproof outerwear is a must. Since I travel for most of my turkey hunting, I always pack extra clothes and even an old turkey vest as a spare. This allows me to hunt in very wet weather and not have to worry too much if something ends up totally soaked. I can go back out hunting with a spare item while the soaked one is drying. I like to wear Lacrosse rubber knee high boots in wet weather. Even in mountains the ankle fit boots will allow me to maneuver around without any problems and still keep my feet dry. I have an insulated pair I use if it is very cold. With the Lacrosse felt insoles, the boots are very comfortable and I can walk all day in them. A good seat or pad that keeps you dry can mean the difference between a pleasant hunt and a miserable one. Calls and other gear should also be protected or waterproof. During snowfall, gun sights may become clogged or covered with snow. Even after it has stopped snowing this may occur as you move about and inadvertently brush snow off branches. This becomes a greater concern if you hunt with a scope or dot-type sight on your gun. I always check my sight frequently to be sure it is clear. A scope or dot sight can also fog up in cold wet weather. First and foremost, I’d like to thank one of our dedicated forum members, Gary Meinke, for providing this target for everyone to use. Its folks like Gary that make Grand Slam Network a great place to hang out! This Turkey Target Download is scaled properly for you to print and pattern your shotgun. Other turkey targets include the actual head and feathers, which can be misleading because you are lead to believe your effective range is further than it actually is. 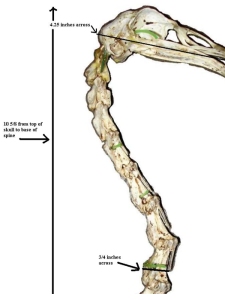 This Turkey Target Download includes the skeletal system of the turkey neck and head, so that you get a more accurate representation of the effectiveness of your gun at a particular range. Post the target is a safe direction and measure off 30 yards which is a nice starting distance. After inspecting the target, you should have a reasonable number of shot in the skeleton. Keep increasing the distance between you and the target until you discover your effective range. 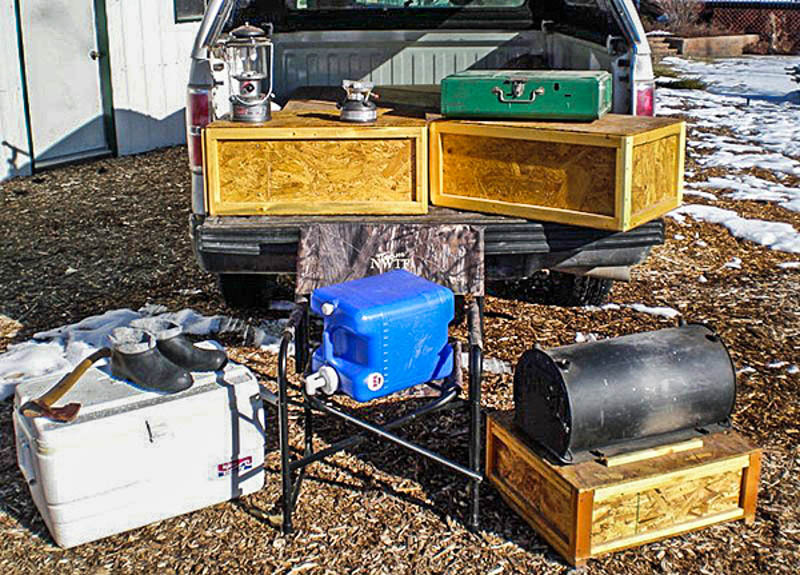 When I first started traveling for my turkey hunting I slept in the back of my pickup truck fitted with a topper. Then I towed a camper trailer for several years. Now I finally have settled on a canvas wall tent as my main camp lodge. I’ve been hunting with one for 7 years now. The wall tent is roomy enough to easily stand up in and it has a woodstove for a source of heat. That heat is what makes the difference between just staying in a tent and having a comfortable abode. I can fit my whole camping outfit in my truck without having to tow a trailer. Not having to tow anything improves gas mileage and also allows me to get into areas I might not be able to get to otherwise. Over the years there have been a number of hunting areas I could not have reached due to muddy and snowy roads, had I been towing a trailer. Another advantage I like about a tent is when the weather gets hot a well ventilated tent set up in the shade can be cooler than a camper. Backwoods camping in the area I hunt is an advantage because there is no driving time. Some motels can be a half hour or even an hour drive from a hunting area. This saves time at both ends of the day, not to mention money. During turkey season the more sleep I can get, the better. I also don’t have to fight sloppy difficult to navigate roads if the weather happens to be bad or turn bad while I’m out hunting. I might not have to “quit early” in order to “get out”. I have refined my tent camping over the years and thought there may be some ideas that could be useful should you decide to try a tent camp for turkey hunting. My wall tent is 10’x12’ and has a frame made from conduit. The canvas is waterproof, mildew resistant and has a fire retardant on it. This type of canvas can be stored wet for a few days, but does need to be dried out before long term storage. There is no other maintenance involved other than storing the tent in a dry place. I keep my tent canvas in a large plastic container to prevent mice or other pests from accessing it. I also have a waterproof tarp specially fitted from the manufacturer to go over the tent. The tarp helps shed a hard rain or snow and also insulates the tent during cold weather. There is no floor in my tent; the woodstove quickly dries out any wet ground. If I happen to expect snow on the ground when I arrive, I bring a scoop shovel to clear the area where the tent will be set up. The woodstove is sized to the tent. Having a stove too large can easily overheat your living space, and too small of a stove may not provide enough heat if the weather turns cold and windy. Most of the wood I use to burn I bring with me, but in some areas you may be able to cut or collect your wood right there. Just be sure it is legal beforehand. Kindling is also brought along to ease the starting or restarting of a fire. Wood ash must be dealt with so I have a small ash shovel and I use a metal bucket to hold the ashes until they are cooled enough for disposal. The ash bucket also carries the tent stakes during transport. 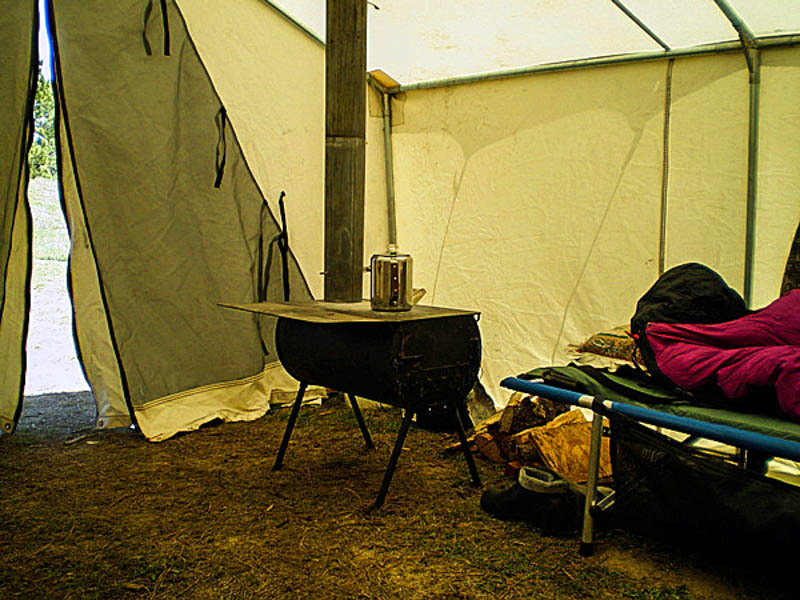 A spark arrester on top of the stovepipe is needed to keep sparks from flying out and landing on the ground, nearby trees or the roof of the tent. The woodstove is also used to do a lot of cooking. I have a couple of Roll-A-Cots® for beds. They get you off the ground for a good nights rest, are light, and pack up fairly small. A pad for the cot will help insulate you from cool air underneath and provide additional padding for comfort. 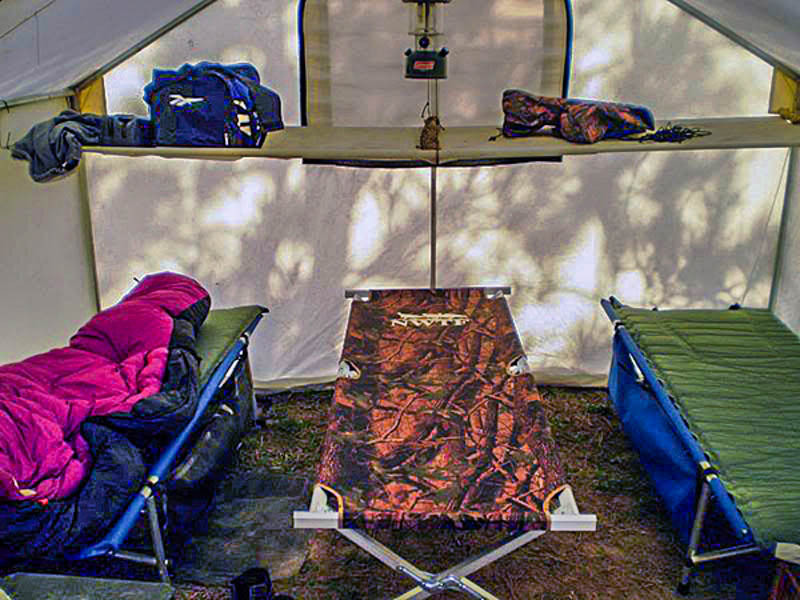 My tent is designed for two hunters, but three hunters can be accommodated. I made a cloth and conduit shelf to go across the back of the tent to keep clothes and other clutter out of the way and off the ground. The shelf is supported by the tent frame and folds up for transport. I built food and kitchen boxes to organize the food and cooking utensils. Most of the items in these boxes are never unpacked. I use the items directly from the storage boxes. To get ready for a trip I just have to resupply some food. A hinged board that stores inside one box goes across the top and locks the two boxes together to make a handy countertop. For transport, the boxes each have a lid and they can be hauled in a horizontal position without disturbing things inside (Fig. 5). Most of the food in the grub box is kept in sealed plastic containers to keep any critters from helping themselves. I also built a box that holds all the woodstove parts (stovepipe, fire grate, etc), except the stove body itself. 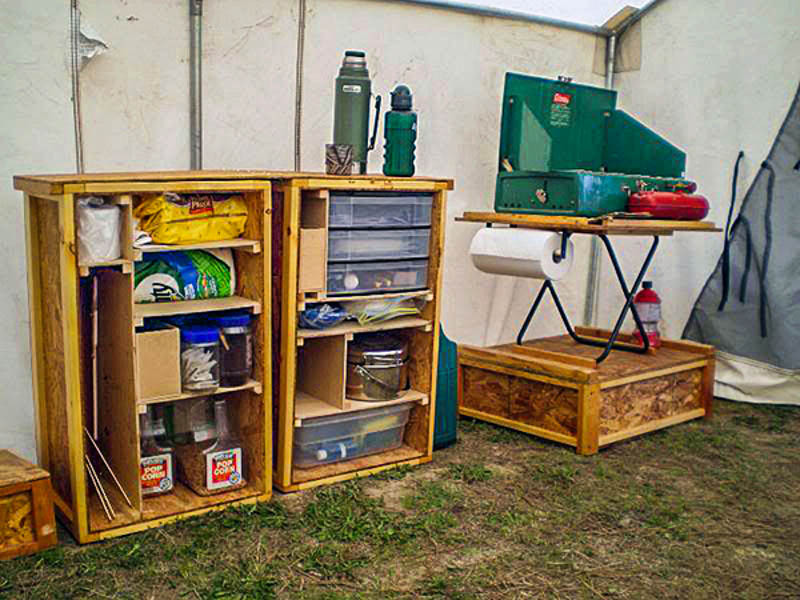 This box then converts into a table for use inside the tent. Below are the grub and kitchen boxes with lids on and ready to transport. The woodstove is on top of the stove parts box/table. A water jug with a spigot is a handy source of running water. I usually carry two of these 7-gallon water containers with me. A Coleman® lantern is used to supply the light at night. The lantern is hung form the center support in the tent and I always have an extra set of mantles on hand. A two burner Coleman® stove is used for cooking if the weather is too hot to have a fire going. A single burner stove can replace the bigger two burner if I don’t expect to do much cooking on it. Camp slippers are very convenient. Mine are just a pair of rubber overshoes with some felt boot liners in them. The liners are cut short so they don’t stick up to far. It’s always nice to get out of the hunting boots, and these slippers are warm, comfy, and easy to get on and off. The rubber allows you to walk around outside if the ground is wet or there is some snow. An axe is always a handy item around camp. The scoop shovel is brought along to clear the ground of snow where the tent will be set up if that is necessary. I use an Igloo® 5-day cooler to store any perishable food. Most of my hunts are about five days and there is usually still some ice left in the cooler on the fifth day, even in hot weather. Since I would rather hunt than cook, I make up three or four days worth of sandwiches already wrapped in cellophane. These are nice to just throw in your vest in the early morning, or have ready to eat when you get back to camp after a hunt. I also freeze some home-cooked dinners (e.g. lasagna, turkey and stuffing) in a vacuum -seal bag and drop them into boiling water to heat them up before unsealing.. The sealed bag dinners really cut down on dirty dishes since I can place the bag in a bowl or pan and cut the top open and eat directly from the open bag. 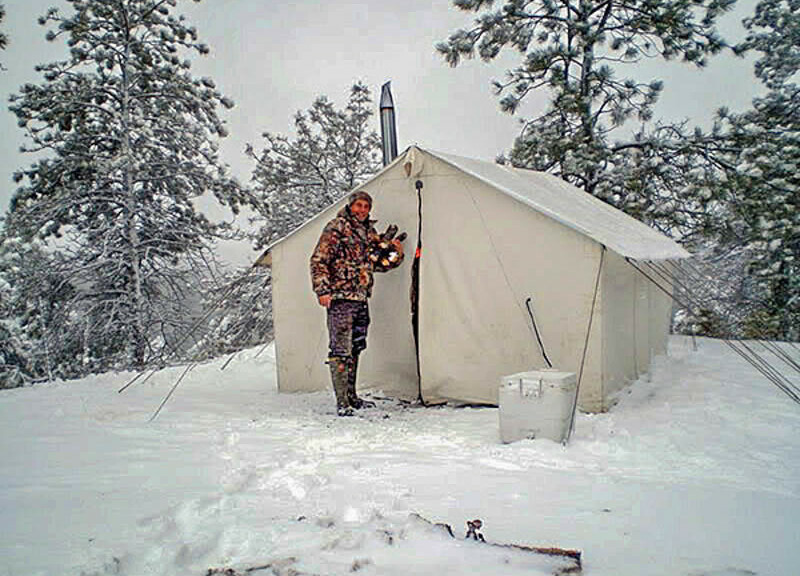 If you think you might want to consider backwoods camping for turkeys, and happen by a wall tent in your travels…well come on in! It’s warm inside and there is a fresh pot of coffee on the woodstove.